Listed on the National Historic Registry, DuBose Conference Center has a rich history on the Monteagle Mountain. Learn more about the story of this unique event venue. In 1870, John Moffatt, a Scottish born temperance preacher, purchased over a thousand acres on the South Cumberland Plateau. This area was known as Moffatt’s Station until 1881, when it was renamed Mont Eagle in 1881 after Lord Mounteagle, an English nobleman. Moffatt and Oliver Maybee were instrumental in convincing Mrs. Louise Yerger and Mrs. Harriet Kells, widows from Jackson, Mississippi, to relocate their girls’ school from Jackson to Moffatt’s Station. Around 1872, John Moffatt donated fifty acres of land to establish Fairmount College. In addition to the land, Moffat also built the first building, with the cost interest free for the first five years and a total of twenty years to pay it off. Fairmount opened in April 1878 with nine students and four teachers. The nearby railroad line of the Tennessee Coal and Railroad Company and the proximity of the University of the South in Sewanee, benefited the new school. Sewanee provided for the spiritual needs of the school by supplying a chaplain, Dr. William Porcher DuBose (1836-1918), who also taught theology at the University of the South. A native of South Carolina, he attended the Military College of South Carolina (now the Citadel),earned his MA from University of Virginia in 1859, and attended Episcopal seminary in South Carolina. He served in the Confederate Army as a Chaplain and was ordained a priest in 1866. He had four children with his wife Anne Barnwell Perronneau, who died two years after the family moved to Sewanee. Several years later, Dr. Dubose married Mrs. Yerger, one of the founders of Fairmount, whom he found to be “a woman of intellectual acquirements and a real thinker.” DuBose went on to establish a national and international reputation as a major theologian in America, a reputation that continues even today. Mrs. Kells returned to Jackson a few years later, where she established the first Women’s Christian Temperance Union in Mississippi with the help of Francis Willard. Silas McBee, who later gained fame as an author and architect, became principal of Fairmount College in 18XX* (*exact date not recorded). McBee turned the school into a church institution that might be “for girls what Sewanee was for young men.” Sewanee professors participated in a series of lectures for students at Fairmount. Mrs. Margaret Weber, Mrs. C.W. Spruill, and later Susan DuBose, daughter of Professor DuBose, all serve as principals of the school. Dr. DuBose’s children were active in the school’s leadership. In addition to Susan, his son, William, became business manager and daughter May was a teacher. In 1910 the Soong sisters from China attended the school, one of whom became Madame Chiang Kai-Shek. The Soong family later planted two Chinese gingko trees on the campus in appreciation of the school. Fairmount closed in 1917, during World War One, and DuBose died in 1918. In 1921, Reverend William Stirling Claiborne (1877-1933) and Dr. Mercer P. Logan founded the DuBose Memorial Church Training School on the former site of Fairmount College. Claiborne, once called “an apostle to the mountaineers,” had previously founded the St. Andrew’s School for Mountain Boys and re-founded St. Mary’s-on-the-Mountain School, among his many missionary projects in the region. He helped to create the school with the support of several prominent Chattanooga Episcopal laymen, to provide a place to train mature men with professional and business experience for the rural ministry. Its curriculum emphasized practical rather than scholarly teaching, including such courses as “The Bible in English,” “Church History,” and “The Contents and Use of the Book of Common Prayer.” In addition to living at DuBose, many of them with established families, they raised vegetables and cattle to help maintain the school and its buildings. The frame buildings burned during the winter of 1924, but were replaced with funds from a campaign which included social events in New York City sponsored by well-known figures such as Franklin D. Roosevelt and Judge William McAdoo. The Reverend William S. Claiborne, for whom the existing structure is named, was instrumental in raising funds to rebuild in 1925. The school expanded following this rebuilding, and many church leaders and several bishops trained there. The DuBose Memorial Church Training School closed in 1944 due to low enrollment. The Chapel of the Holy Comforter was constructed to serve Fairmount College in the 1880s, and the Reverend Doctor Dubose served as its first chaplain. In 1918, his son, Reverend Haskell DuBose, became priest there. The original Chapel of the Holy Comforter building was destroyed by fire in 1950. In 1957, its services moved to the former community center at DuBose. This site was also destroyed by fire in 1981, when the Church of the Holy Comforter was reconstructed in its current building opposite DuBose Conference Center. In the early 1950’s, the “then one” Episcopal Diocese of Tennessee purchased the buildings and grounds of the old Church Training School and reopened as the DuBose Conference Center. At that time, a trust was established with the funds from the sale that still provides scholarships to Episcopal seminarians throughout the country. In 1953, Camp Gailor-Maxon moved from its earlier venues to find a permanent home at DuBose. The Diocese began capital improvements to the school, including the construction of four new cabins and a swimming pool. In 1958, a new outdoor pavilion was constructed to accommodate the growing Laymen’s Conference of the Episcopal Churchmen of Tennessee, which is still going strong today. The Diocese of Tennessee built Bishop’s Hall in 1973 and expanded the “Stack Room” in the Pell Library Building to create the large chapel. Key to the success of the camp and conference center was the leadership of Ernie and Winnie Walker, who oversaw all aspects of the organization and its facilities. In 1975 Camp Gailor-Maxon constructed the outdoor chapel and campfire area. In 1982 DuBose was placed on the National Register of Historic Places. In 1982 the Diocese of West Tennessee was formed, followed three years later by the formation of the Diocese of East Tennessee, leaving middle Tennessee as the continuing Diocese of Tennessee. Before, DuBose had operated as a part of the Diocese of Tennessee, and all staff and expenses were line-items on the diocesan budget. Now, the historic center belonged to all three dioceses, but received direct financial support from none of them. Leadership was provided by a series of Executive Directors and the three diocesan Bishops and their appointees formed the Board of Directors. In the early 1990’s a decision was made to reconfigure the board to include several “at large” members who would represent constituent user groups of the center; and to actively pursue increased utilization by other denominations and secular groups to improve business results. Led ably by Executive Director Randy Schulte and Guest Service Manager Kim Terry Agee, the center began to run on a more positive business footing. After an intervening director, Kim Agee took over the position and oversaw the operations for 10 years, until her retirement. Around 2000, Cabins 5 and 6 were constructed to offer year-round heated lodging spaces for youth groups and other retreats. During this period Bob Van Cleave and other friends of DuBose accomplished an ambitious plan to re-roof the clay tile on Claiborne Hall. Another significant change occurred in the late 2000’s, when the Board elected to transition DuBose to a 501c3 Nonprofit organization, still affiliated with the three Tennessee Dioceses, but run by a 21-member Board of Directors (on which the TN bishops are ex-Officio member). This allows the center to benefit from its Episcopal roots, but potentially draw on support from secular foundations to achieve its mission. Grundy County, which is the poorest county in Tennessee (and one of the poorest in the nation) is dead last (95th out of 95 TN counties) on the Robert Wood Johnson Health Index. DuBose has begun active engagement in the local community as has become home to several AmeriCorps VISTA workers and interns who are working to improve the quality of life and health in the region. 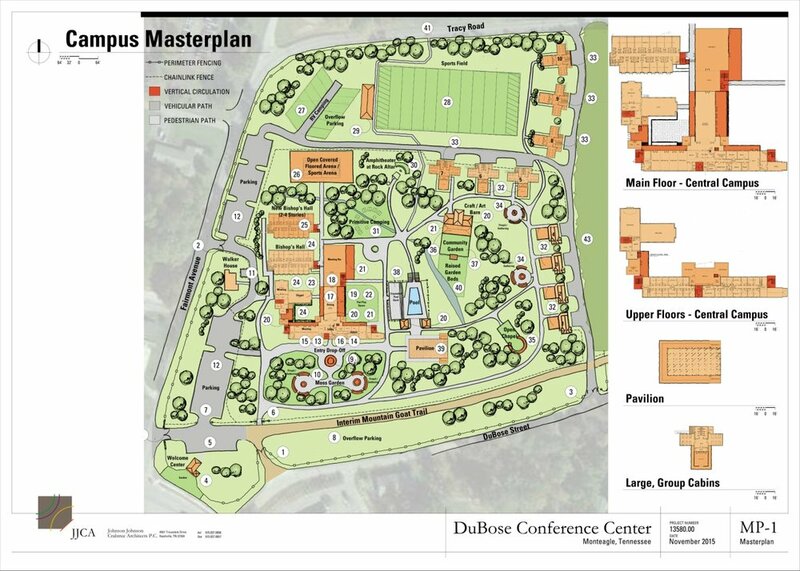 Today DuBose is a vibrant year-round camp, conference, and retreat center boasting improved facilities and a garden that provides fresh herbs and vegetables for its dining service. In addition to the historic groups like Camp Gailor-Maxon and the Laymen’s Conference, DuBose hosts band camps, 12-step retreats, leadership groups, and every religious secular affiliation you can imagine. With a bold Strategic Plan adopted in 2015, which calls for increased utilization, and a comprehensive Master Plan for the buildings and grounds, the organization is poised to move into a sustainable future. In 2017 DuBose launched “Vision 20/20” a capital campaign to provide funds that will continue to address capital projects as they present themselves, and that will begin to move the organization towards Phase I of the Master Plan. DuBose Conference Center is a tremendous historic asset that demands our care. It is at places like this that strong leaders are formed!